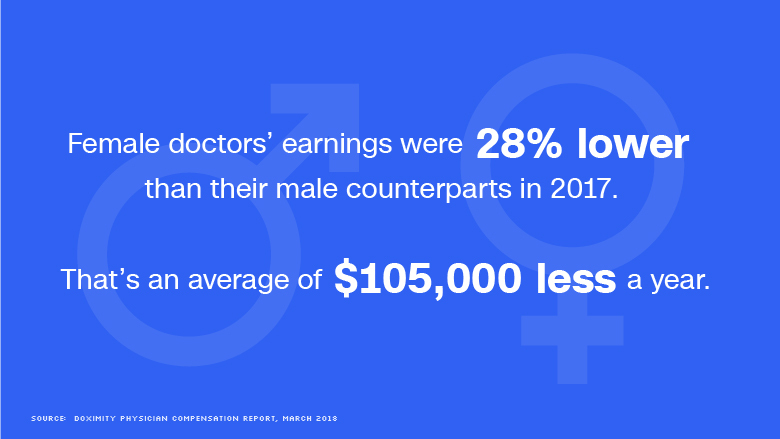 They also attended medical school and underwent the same years of rigorous training, but female doctors in the United States are earning significantly less than their male peers -- and the pay gap is only growing wider. Women doctors earned an average of 27.7% less than their male counterparts in 2017, according to a new survey of 65,000 physicians by Doximity, a social networking platform for health care professionals. That's an average of $105,000 less a year. "The gender pay disparity is disappointing and it's a serious issue that we want to rectify," said Dr. Amit Phull, Doximity's vice president of strategy and insights. Doximity's second annual report found that physician compensation rose 4% year-over-year, which was faster than the national wage growth of 2.6%. But gender disparity in pay persisted in a striking way. The pay gap had widened from the prior year, when Doximity found women physicians were making an average of 26.5% less than men. And the researchers reported that the inequities persisted across all 40 medical specialties and 50 metropolitan areas that it analyzed. The gender pay gap was most pronounced in Charleston, South Carolina, where women doctors earned 37%, or $134,499, less than male doctors, last year. That was followed by Kansas City, Missouri, where the gap was 32%, or $131,996. The report did not explain why the disparity was more glaring in these cities. "Unlike other industries, the medical profession doesn't openly reveal or discuss salaries," said Phull. "If physicians know how much their peers are making, it will give them better leverage to negotiate their pay. We want this report to provide some transparency." According to the report, specialties with the largest pay gaps of about 20% included hematology, occupational medicine and urology. The fields with the smallest wage disparity, such as in pediatric cardiology and geriatrics, still saw female doctors earning 15% less than male doctors. 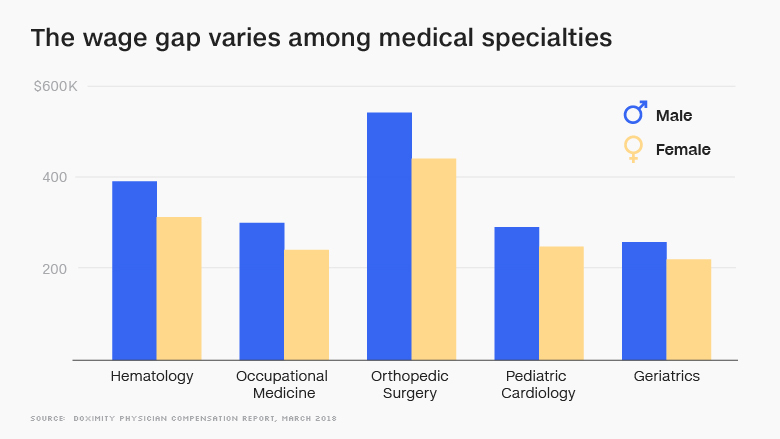 "Even with the wage gap, medical specialists do earn much more than many other professions. But doctors also spend many years in training and incur significant school debt by the time they start practicing. And we never come off the clock," noted Kim Templeton, a professor of orthopedic surgery at the University of Kansas Medical Center in Kansas City. The average medical school debt in 2016, for example, was about $190,000, according to the Association of American Medical Colleges. Once a year, Dr. Theresa Rohr-Kirchgraber, an associate professor of internal medicine and pediatrics at Indiana University School of Medicine, holds a class called Negotiating the Pay Divide to raise awareness about the medical field's pay gap. "In my career as a physician, I know I have been paid less than male colleagues. No friggin' way I should be, but I am," she said. "There's this perception that's persisted, and I don't know why, that women don't need as much. It's not just in medicine, but across industries." Dr. Theresa Rohr-Kirchgraber holds a class once a year called Negotiating the Pay Divide. She wants women physicians to become proactive about negotiating salaries. "Closing this pay gap isn't just about getting extra income. 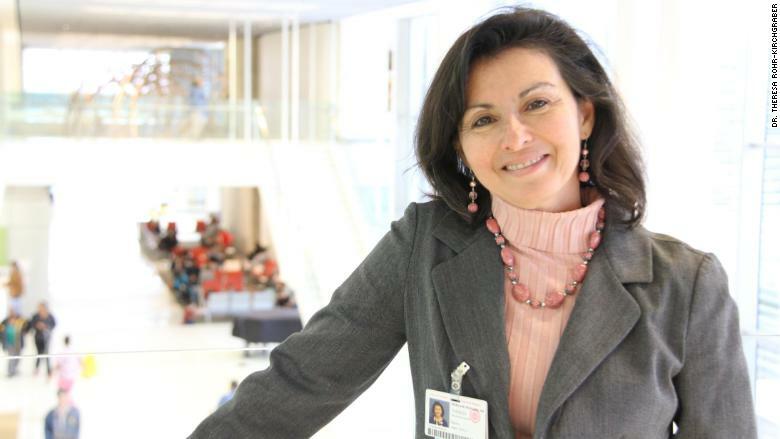 It's about eliminating an unconscious bias that exists in medicine," she said. "Some people have said women doctors don't see as many patients as male doctors because they have other responsibilities at home with kids. That's why they make less," said Templeton. "Decades later, the assumption is that [male doctors] should make more because they are taking care of the family." Templeton believes income should be based on expertise and qualifications, not assumptions. "As far as medical training goes, it is the same for both genders." "We don't want it to get worse," says Dr. Fatima Stanford. 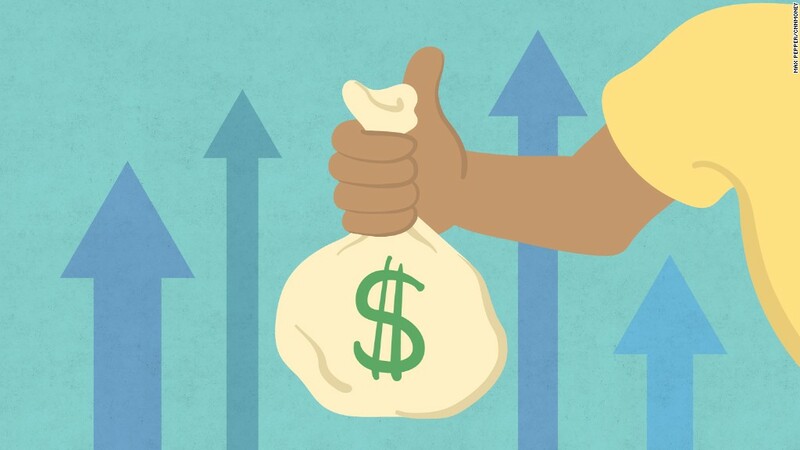 "Medical students aren't taught how to negotiate salaries. 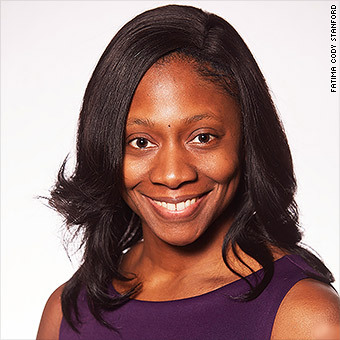 But it's vital for them, especially for women, to learn this skill," said Dr. Fatima Stanford, who specializes in obesity medicine and nutrition at the Massachusetts General Hospital and is on faculty at Harvard Medical School. If the pay gap continues to widen, less pay combined with physician burnout might lead to more female doctors leaving the profession, she said. "I've seen this shift happening with my friends. They are leaving medicine for the pharmaceutical industry, business and other industries where they feel they are better respected and compensated," said Stanford. " At a time when we have a looming doctor shortage in America, we really don't want it to get worse."